You may remember yesterday I posted a video showing of the new Android build 1.6 (now with techno), and how I some of you thought I made an error and pointed out that Donut was coming out that night. Well, you were right, it was a mistake, but I was not mistaken. Seeing as our sources later told us that Android 1.6 was going to be pushed to a select set of G1 users that very night. Well, it is now about 12 hours after the fact and there have been confirmed reports (and a confirmation form T-Mobile themselves) that Donut updates have officially started. So, let me just take the time to point this out, donot (see what I did there) doubt us! Check out what T-Mobile had to say on the matter after the break and tell us what you think in the comments! * An improved Android Market experience that makes it easier to discover great applications. * Updated search experience that make it easier to search various sources, such as browser bookmarks & history, contacts, and the web, directly from the home screen. yea I got the update this morning. The reboot takes about 2 minutes on the G1, well mine at least. After a few minutes of wonkiness it all smooths out and I think 1.6 fixes a few lag issues. Yeah @ Buffwhat. Hopefully, this update fixes my lag. If not, i’m going to have to exchange to another phone. Cause my lag is horrific. I hope this fixes my battery problem, it’s making me crazy. It never shows “fully charged” until I restart the dang thing. Less lag would be nice too. Besides that this G1 is a fun little phone. I’m interested to see the differences from Cyanogen 4.1.11.1 rom. if im not missing out on anything ill keep what i got. Hey, they finally fixed that 911 issue. It’s kinda scary knowing that I wasn’t the only one who had that problem. On June 12 of this year I was in a car accident, called 911 on my G1 and it rebooted as soon as the operator answered. That did not help my nerves any. is there a site we can download this manually? Just got mine today guys via wi-fi for my G1….loving it so far…Market by far is biggest improvement…nice interface….now if the folks at Adobe could get their act together for the flash player for the android operating system…i will love this phone all over again. Now stop asking and if you want flash buy a computer. So, will ABQ get Donut before 3G?!?!?! 3rd quarter is over, Tmo, and my G-cap is still 2! Land of the trill…..for your infoormation I have a computer……so if I happen to inquire about something on a website for my phone please feel free to keep your negative comments to yourself…..
WHT HAPPEN TO MY YOUTUBE ITS GONE!!!! got a ??? if were spose to be getting adobe plash player beta then why dont they wait to push the android 2.0 update cuz i been reading and they people are saying they are gonna push the android update 2.0 along with the adobe flash player update on the same day of the beta release and it is spose be the donut update,so im so darn confused becuase the update we spose be getting is only the android 1.6 update and not the 2.0 update and there only 2 days left till the adobe max 2009 release of the beta release. I have mytouch and i haven’t got my update yet and i live in Kansas city,Kansas. I have a white mytouch–I live in Indiana. I got the update for the My Account, but not the update for the Donut 1.6! I have a mytouch and I live in San Antonio Texas. I got the my account update but the the 1.6 yet :(. I hope it hurry I excited. I too live in San Antonio, and still waiting in line for my Donut. LOL!!! 24 hrs has passed since the first batch, so everyone should be getting it soon. Note: it has been said that Adobe Flash will not be able to be supported on G1’s due to memorey issues when flash is pushed out in the near future. For the folks who (obviously) missed it earlier, your physical location has absolutely ZIP to do with you getting the update. Got my G1 update this morning. Miami!!!! Lost my youtube on my homescreen, but still works on the popup menu. Has Anyone Else Gotten An Update… I Am Going Insane Waiting Over Here… Even Contacted A Tmo Rep …. No Help. updated this morning. The htc keyboard i use on my mytouch no longer works which totally blows. others are experiencing the same issue so hopefully they fix that soon as i hate the default keyboard. Just got my update this morning. What’s your location for those that have it? Just got my UPDATE!!!! Washington DC, YA. My wife and I have two identical myTouch 3Gs. They were both sitting on the kitchen counter 6 inches apart charging last night and and hers got the update and mine did not. So evidently location is not the only factor. Ight I promise I was going to comment today about the update so far so good am still playing whit. I do notice my mytouch is a lot faster and better respond. Voice command like calling is great. Also new youtube and market a lot better. There is no much to say for now ama keep playing around whit it o n b4 I forget the search is a lot better went u look for local store u have the option to call from home screen o look at it on the map. Does lucky pol the got the update no wat am talking about. Received my update for my MyTouch this afternoon. Logan, UT. My wife is still waiting for hers. Got my update this morning (Sunday). My friends are still waiting for theirs. Can someone help with this question? I have Mytouch as primary and G1 as back up. Well, mytouch battery died so I switched sim onphones. I was charging mytouch and update was promoted on G1 , so I went ahead. Will I get an update to mytouch aswell when I re-insert my sim card? 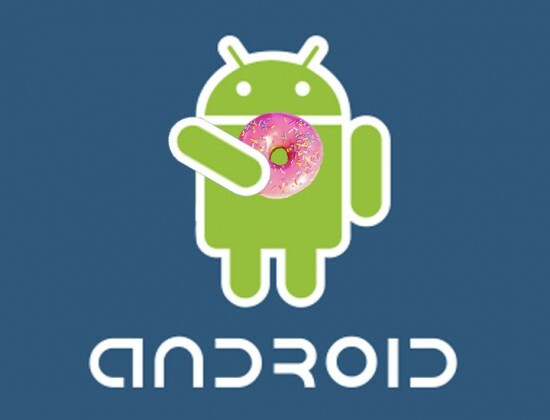 I got my donut this morning on my MyTouch.